Social media is a crucial tool for success in business today. People are already talking about your business using social media, whether you're using it or not. By becoming part of the conversation, you can start connecting directly to your customers, as well as finding new ones, easily and inexpensively spreading the word about your products or services.But social media marketing isn't like traditional marketing-and treating it that way only leads to frustration. 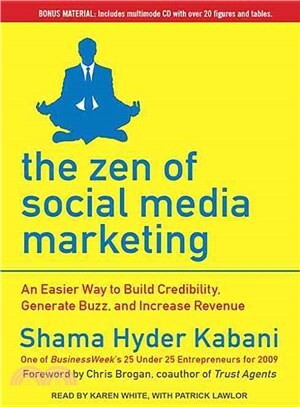 Let Shama Hyder Kabani, president of Web marketing firm Marketing Zen and social media expert, teach you the ?zen” of social media marketing: how to access all the benefits of social media marketing without the stress!With a foreword by New York Times bestselling author Chris Brogan, The Zen of Social Media Marketing outlines the most popular social media tools, from Facebook to Twitter to LinkedIn, and teaches you how to use them, step by step. She provides proven strategies for success from the businesses she works with every day, along with shortcuts and tips to help you make the most of your time and energy.The Zen of Social Media Marketing is also the last social media guide you'll ever need: with the physical book you also get access to the exclusive online edition, which includes regular updates and video extras to make sure you're always on top of the latest in social media.